By 1985, George A. Romero had basically nothing left to prove. His resumé was stuffed with the kind of classics that most directors couldn't come near, even with unlimited backing and unhindered creative control. He'd told some of the most frightening stories ever about zombies, about people, about vampires, and about the EC Comics he grew up with. Sitting on the top of his game, he crafted the screenplay for an epic zombie film the likes the world had never seen -- and probably never will. There's some consternation in the ranks of horror fans. "Day of the Dead could've been so much better if they'd just funded Romero's original vision." I can't say that's true; I've never read the initial script. All I have to judge is the film he did make on half the budget. I'll tell you something, it's actually pretty damn good. Actually, the film could've been perfect but for the actors. I specifically refer to Mr. Joe Pilato, although others could easily be substituted in. Pilato plays Captain Rhodes, the military head of an underground scientific complex dedicated to solving "the zombie problem" (and quite a problem it is; they outnumber living humans at 400,000 to 1). Rhodes should be a complex character, and, for the most part, it's easy to see that he was written that way. For a lot of the film's dramatics to work properly, we have to believe that Rhodes is a human being driven to inhumanity by his situation. Pilato gives us a howling creepazoid, a monster in military greens. It's apparent from his first frame to his last that this man is Pure Evil, and he comes off as funny when he's not pathetic. Although Rhodes is (sadly) key, he's not the lead -- that belongs solely to Lori Cardille as tough scientist chick Sarah. In an unusual move for Romero's Dead films, the ensemble nature of the cast is de-emphasized in favor of a heavier focus on a central figure. The effect is an increased feeling of isolation. Even with a boyfriend and coworkers, Sarah is alone in her battles to stay sane and alive. It's not until she gives up on the rest of the world that the locus expands to include two others who have long held a similar philosophy. Romero's obsession with social decay is at the most vehement point the director's oeuvre would see. Society's broken down already in Day. There's no civilization left, just shards barely containing themselves in concrete bunkers. All the unspoken codes have broken down and order is "maintained" by shoving a gun in its face and screaming at it to behave. Dr. Logan (Richard Liberty) is Romero's mouthpiece in Day. He passionately speaks of giving zombies manners, training them, keeping them docile and harmless. He speaks of positive reinforcement as if it is the needle with which all civilization is woven. His purpose is the same as Rhodes's: maintain order. He seeks to do it by rebuilding the world as he knew it; Rhodes does it by tearing the world around him down. Logan's not much of an angel himself, despite his cheery demeanor. His own desperation is as rampant, if not moreso, as the rest of the bunker's. 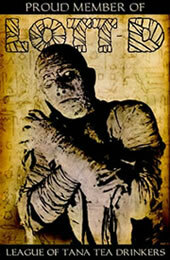 He redirects into bloody experiments that have earned him the rather appropriate nickname of "Dr. Frankenstein." Romero wisely chooses to make the ambiguities of Logan's character apparent from the time we first meet him. Indeed, none of the characters are mysteries when we meet them. They all have little personality tics and quirks that become more dangerous and scary as the film progresses and the tension mounts. It may be ridiculous, entirely smug, or even deeply obvious to say this, but the character that displays the most human emotion (or, at the very least, what the movies have taught us is human emotion) is a zombie. I speak of Bub (Howard Sherman), Logan's most successful experiment. Bub is retrained to remember his human life and even accepts Logan as a father figure (and the "Frankenstein" moniker becomes more appropriate). His progress, however, brings about a more chilling set of possibilities. How dangerous could a little thought be in the hands of millions of marauding zombies? Romero maintains the basic structure of the previous two Dead films, which provides a certain sense of continuity to the proceedings. Fans familiar with Night of the Living Dead and Dawn of the Dead should have no problem figuring out what's going to happen in the end. This is, after all, a zombie movie -- an unrated zombie movie, to be really precise -- and the monsters must roam. The sense of inevitability is not ignored. Indeed, it is toyed with at any number of opportunities. A newcomer to the series will enjoy this as much as a jaded Romero fan. Tom Savini makes sure that every little bit of the non-rating is exploited. While his technical effects have since been surpassed, they still hold up remarkably well against the modern infusion of computer generated imagery. People get ripped apart; guts fall out of torsos; throats get huge chunks chomped out of them. It's not your standard day in goreland and it's all handled with mastery. I'm still more impressed by the work on display here than I am the digital decapitations we get today. Even better, though, is the fact that Romero's direction and the way it makes the heart race. The opening sequence is particularly famous for its imagery, but it's also extremely well-timed. It lingers in the anticipation of the moment, waiting for the viewer to assume that maybe this time, in this showing of the film, the scary thing won't happen and then BAM! The adrenaline shoots through the veins and the film is off on a roller coaster that only gets sluggish in a few spots. It's certainly a better paced film than Dawn in a lot of ways. 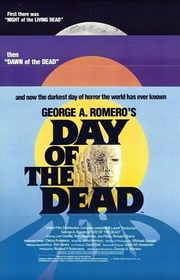 Romero's in pre-production for the fourth film in the series, Land of the Dead. Hopefully, he'll get to incorporate a few of the ideas that he didn't get to use in his grander vision of Day. As it stands, he's already made a pretty great film out of the remains of that other screenplay, so there's few regrets on this end. It's not as brilliant as much of what came before, but it stands out in its own right. Look for Romero as a cart-pushing zombie towards the end of the film. Romero's original script would have cost over 7 million dollars. However, his distributor would only put up the funds if Romero could guarantee an R-rating (something the director refused to do). He only received 3.5 million, and thus had to drastically reduce his vision. Rhodes's last line was an ad-lib. Joe Pilato's attempts at improvising dialogue had been shut down by Romero the entire film, so when his complicated and technical final scene came up, he managed to spit out the line - twice. It would have been too expensive to reshoot, so Romero left it in.